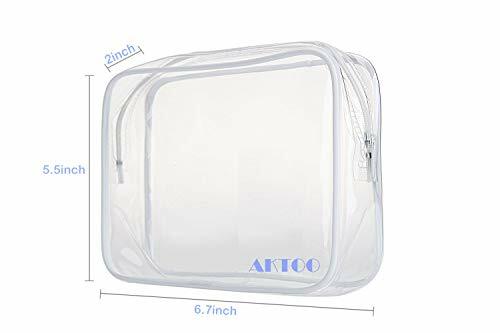 The Aktoo travel bottles set with compact and portable design are great for business trips, vacations, camping, picnics and other occasions. We fully stand behind our products for their quality and longevity. 1. Wide Application：Safe for other liquids like shampoo, conditioner, body lotion or other toiletries. And suitable for salad dressing, ketchup, mustard etc. 2. BPA Free Food Grade Silicone：100% BPA-free, FDA approved, LFGB standard, Non-toxic, Odorless. 3. Triple Leak Proof： 3 layers cover on the cap for sealing up. 4. No drip valve：Leakproof cross valve to prevent leakage and control the flow. 5. Wide Mouth：Easy to fill, refill and clean. 6. TSA Approved：Capacity marked on the bottle body. Safe for carry-on and airline travel. 7. Soft & Flexible Body：With soft silicone body, easy to squeeze, better than stiff plastic bottle. 8. Transparent Bottle：Using dull polish technology and presenting translucent appearance, help to know the liquid usage. 9. Compact & Lightweight：Perfect size with small profile and package weight only 0.4lb for convenient carrying. 10. Different Labels & Colors：Different colors with switchable labels on the cap for easily identify contents in the bottle. 1.Travel bottles are not suitable for Hair Serums, Oils, Alcohols, Salicylic Acid, Hydrogen Peroxide, Caustic, Corrosive or Flammable products. 2.Do not overfill your squeeze travel bottle, this may cause the caps to not seal properly making the content inside to ooz out. 3. Fill it up at least 3/4 of the desired liquid you want to put inside it, leaving room for air. 100% LEAK PROOF DESIGN and NO WASTE：TRIPLE LEAK PROOF! The Aktoo silicone travel bottles are designed with a cross-shaped opening in the outlet valve and 3-layer anti-leakage cap design! Bottle sealing design control the flow and makes zero wasting. Even if reverse the bottle,the inner liquid will not leak out.So that you don’t have to worry about the liquids leaks from every trip. 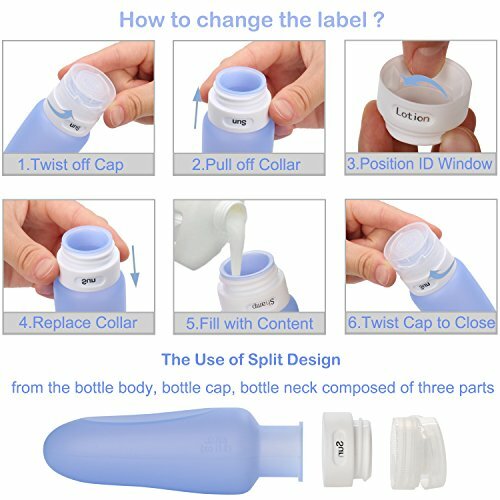 FOOD GRADE BPA FREE SILICONE : Aktoo travel bottles are made of FDA approved and 100% BPA free food grade silicone,non-toxic, odorless, making it safe for other liquids like shampoo, conditioner, body lotion, body wash, face wash, sunblock, liquid soap, coconut oil, or other toiletries. Food grade silicon also suitable for salad dressing, ketchup, mustard etc. in your lunch box. TSA-APPROVED and EVA CLEAR TRAVEL CASE：Capacity marked on the bottle body,3oz with their perfect size is TSA Airline carry-on approved. 4 Pcs pack is great outdoor solution for business or personal travel. There is no need to worry about carrying too many big bottles when traveling. Come with a zippered clear toiletry bag, portable, compact, easy solution to security check-ins. 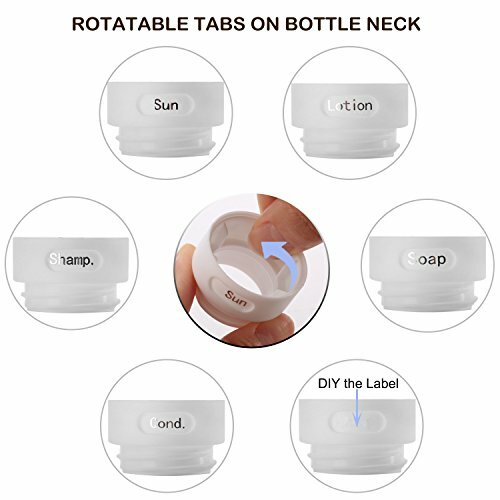 EASY TO DISTINGUISH with SWITCHABLE LABELS：6 different labels (shamp,lotion,cond,sun,soap and 1 is DIY) on the ID window and they are switchable, you could change the label in the neck of the cap according to the contents filled in the travel bottles. And also 4 different colors help you easily identify contents in the bottle. HIGH QUALITY and EASY TO REFILL,CLEAN : These travel accessories are made of premium-quality silicone + PP material, super compression resistance, lightness and durable. Soft and squeezable body with wide mouth for easy refill and cleaning.The caps are made of high-quality plastic material, durable to prevent the connector break. Using dull polish technology and presenting translucent appearance,help to know the liquid usage.